This page contains information for current and prospective Section 8 landlords. Scroll down to select a topic that you would like additional information on. The Housing Choice Voucher (HCV) program is administered locally by the Housing Authority. It is funded by the U.S. Department of Housing and Urban Development (HUD) and is designed to help low-income families rent safe and decent housing on the open market in Hagerstown, MD. The program is a three way partnership between the family, the housing authroity, and the landlord. Signs the landlords lease agreement and agrees to pay their portion of the rent as well as to abide by the terms of the lease and maintain the property. Ensures that the family meets all program requirements including income and eligibility. Issues a voucher to eligible families that provides them with rental assistance. 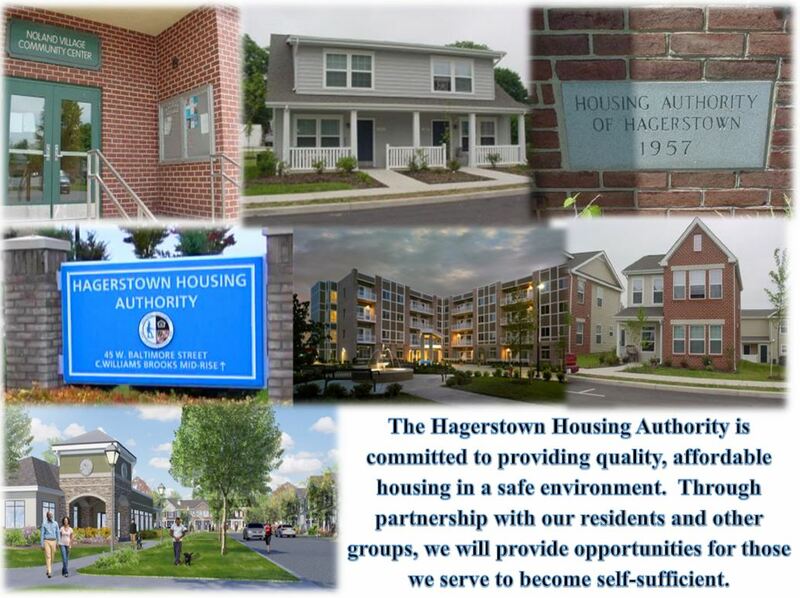 Enters into a Housing Assistance payment (HAP) contract with the housing authority. Agrees to maitain the property to Housing Quaility Standards (HQS). Landlords become involved by agreeing to rent to a family that has Section 8 assistance. Families contact the landlord directly, or landlords may list available rental properties, free of charge, online at Maryland Housing Search using the button below. From the listing, eligible families contact landlords and landlords screen and select a family. The property is then inspected for compliance with HUD standards. After the unit passes the inspection, a Housing Assistance Payments (HAP) Contract is executed between the landlord and the Housing Authority to begin subsidy payments, and a lease is executed between the landlord and the tenant. Owners have security in knowing at least a portion of the rent will be paid timely each month. Rent amounts are based on Fair Market Rents determined and published by HUD. HHA will regularly inspect your property to ensure it is being properly maintained. Landlords use their own lease and set the terms and conditions in the lease. The video on the right will provide additional information regarding the Housing Choice Voucher/Section 8 program. For further information, please visit our FAQs or the Section 8 program page. The subsidy for most families is the difference between 30 percent of the family’s adjusted monthly income and a “payment standard” that is based on the HUD-published Fair Market Rents (FMRs). If the rent is more than the payment standard, the family pays a larger share. A family may not pay more than 40% of their adjusted monthly income for rent when the family first receives Section 8 assistance, or when a family moves to a new unit. The Housing Assistance Payment (HAP) contract is executed between HHA and the property owner or landlord. This contract is entered to provide assistance for the family under the Section 8 voucher program. The HAP contract is displayed to the right. To learn more about the federal regulations governing this program, click the learn more button button below. Inspections are required of all Section 8 properties. This section will provide you with insight on what our inspectors will check during these inspections. For buildings built prior to 1978. If the property is to be rented to a family with a child under the age of 6 and/or a preganant person, there can be no chipping or peeling paint anywhere on the exterior of the building, including any outbuildings, or on any part of the interior of the building that the tenant has access to. separately metered. All tenant paid utilities must be put in tenants name prior to unit passing inspection. Smoke detectors are required on all habitable levels and basements and be in compliance with all city and fire codes. All sleeping areas (living room, dining room and bedrooms) are required to have a minimum of 2 separate means of egress. Egress windows have to have a minimum of 5.7 square feet of openable window space. • Kitchen and bathrooms must have a permanently installed light fixture. How does participation benefit the landlord? Landlords receive timely and direct program payments, are assisted in the screening process, and partner with the local housing agency in the provision of decent safe, and sanitary housing to lower-income families. Many owners experience reduced vacancy and turnover expense due to the potential for long-term stable tenancies. What standards must the property meet? General health and safety standards specified by the Department of Housing and Urban Development (HUD), known as Housing Quality Standards (HQS), and portions of the BOCA National Property Maintenance Code. Initial and annual or biennial inspections are made of all properties, which may be duplexes, apartments, single family dwellings, or mobile homes. How may a landlord obtain information about the suitability of an applicant? Prior to leasing the unit, the Housing Authority provides landlords with the name and address of the family’s current and prior landlords. Landlords are encouraged to conduct landlord-reference checks. Landlords may also wish to contact utility companies and other creditors. Landlords are encouraged to screen families with regard to: 1) payment of rent and utility bills; 2) caring for a unit; and 3) respecting the rights of others to peaceful enjoyment of their housing. What is the term of the assisted tenancy? The term of the assisted tenancy is based on the beginning date of the HAP Contract, which begins when the dwelling passes the inspection and the lease is executed. The initial term of the lease must be for at least one year and must provide for automatic renewal for successive terms (e.g., month-to-month or year-to-year). May a landlord collect a full security deposit? Yes. Landlords may collect a deposit not to exceed amounts charged to unassisted families and in accordance with Maryland State Law. What are the major responsibilities of participating families? 1) comply with the lease and the Family Obligations as specified by HUD regulations; 2) maintain the unit; 3) pay rent portion and utilities when due; 4) report changes in income and family size within 14 days to the Housing Authority; 5) not engage in drug or criminal activity; 6) not allow unauthorized persons to live in the unit. What are the major responsibilities of landlords? 1) screen the family for suitability; 2) collect the security deposit and rent portion from the family; 3) maintain the unit and provide utilities, appliances, and services as specified in lease; 4) notify the Housing Authority of any known condition that would affect the amount of subsidy. How does a landlord participate? Landlords become involved by agreeing to rent to a family that has Section 8 assistance. Families contact the landlord directly, or landlords may list available rental properties, free of charge, online at www.mdhousingsearch.org or by calling 1-877-428-8844. From the listing, eligible families contact landlords and landlords screen and select a family. The property is then inspected for compliance with HUD standards. After the unit passes the inspection, a Housing Assistance Payments (HAP) Contract is executed between the landlord and the Housing Authority to begin subsidy payments, and a lease is executed between the landlord and the tenant. A family may complete an application online or in person at the Housing Authority office, located at 35 West Baltimore Street. Applications may also be mailed to the same address. Applicant names are placed on a wait list according to date of application and preference points. The waiting period is for funds to become available to subsidize the next family on the wait list, not for the availability of a unit. Are there any restrictions on the selection of a family? Yes, owners (including a principal or other interested party) may not rent to a relative, which includes the parent, child, grandparent, grandchild, sister, or brother of any member of the family, unless the Housing Authority has determined (and has notified the owner and the family of such determination) that approving rental of the unit, notwithstanding such relationship, would provide reasonable accommodation for a family member who is a person with disabilities. May a landlord use a private market lease? Yes, because the Housing Authority does not provide the lease. The lease must contain terms consistent with federal and state requirements. How may a lease terminate? After the initial term, the owner and family may terminate without cause. During the initial term the lease may be terminated on grounds of serious and repeated lease violations. What are the major responsibilities of the Housing Authority? 1) determine family eligibility and who may live in the unit; 2) approve unit rent to owner and determine subsidy and family portion; 3) make subsidy payment to the landlord each month; 4) conduct required inspections and family certifications; and 5) determine whether to terminate assistance to a participant family for violation of family obligations. How is the rental subsidy amount determined? No cap exists on the rent. However the unit rent, plus any utility allowance for family-paid utilities, must be reasonable in relation to comparable units on the local rental housing market. Current Landlords may use the button below to view their payment history.